Let’s begin with the GreenWorks 2600502 13 Amp 20″ Corded Snow Thrower—one of the most environment friendly snow blowers among the best snow blowers currently available in the market. 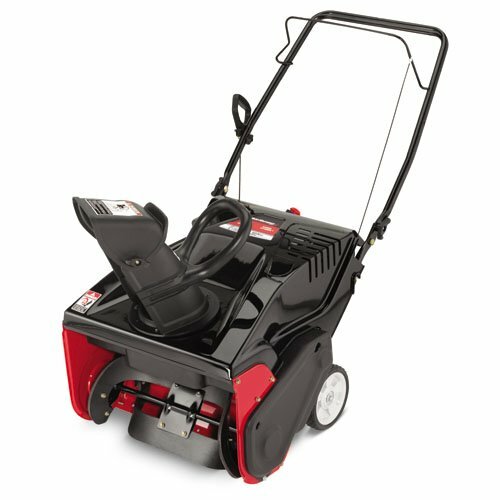 Having a series-wound 13 amp motor, the aforementioned electric snow blower emits virtually no fumes that can be harmful to the environment. Moreover, unlike gas snow blowers, the electric snow blower requires neither spark plug changing nor tuning-up; which means the electric snow blower will produce less waste than gas snow blowers in general. Coming in at just 30 lbs (48.63lbs when shipped), and 37″ x 21.6″ x 31″ in dimensions, the GreenWorks 2600502 is also easy to maneuver. Compact as it may be, it doesn’t mean this electric snow blower won’t be much help with clearing snow away. Being capable of clearing away snow at 850 lbs per minute, and having a clearing width of 20 in, the electric snow blower will be able to help you easily deal with snow—even several-inches-deep snow. To prevent you from losing control over it when in use, the electric snow blower comes with an adjustable handle; which you may slide and/or rotate until it fits snugly in your palm. The rest of the useful features of the electric snow blower are: an adjustable 180 degree directional chute will make throwing of snows more manageable than ever; durable plastic body; easy start-up even on cold days; extension cord that can be locked in place; and resistance to rust. Despite the undeniable usefulness of the GreenWorks 2600502 Snow Thrower, a few consumers have taken note of some drawbacks to this electric snow blower. According to them: Starting it up isn’t as easy as expected and the extension cord is a hassle to lug or drag around. The electric snow blower, however, has received a rating of 4.4 stars out of 5 on Amazon with free shipping. If you’d like a snow blower that can generate more power than the snow blower previously reviewed, you should check out the gas snow blowers among the best snow blowers currently available in the market. To get you started, we present you the Yard Machines 123cc OHV 4-Cycle Gas Powered 21-Inch Single-Stage Snow Thrower. Thanks to its 123cc overhead valve (OHV) engine, the Yard Machines 4-Cycle Gas Powered Self Propelled Two-Stage Snow Thrower has a 21 ins clearing width, 13-inch steel auger — slightly more than both of the similar capabilities of the electric snow blower previously reviewed and improve snow removal over single-stage units. Since such power could make maneuvering it difficult, the gas snow blower comes with a joystick and several speed settings (4 forward, 2 reverse); making maneuvering the gas snow blower truly easy. The rest of the useful features of the gas snow blower are: electric start-up, which makes activating the gas snow blower as easy as pressing a button; adjustable ‘skid shoes’ that allow you to raise or lower the gas snow blower in order to let you use it on dirt, concrete, and ice and has 180-degree chute rotation adjusts easily and resists clogging, rusting, or freezing. Unlike the electric snow blower previously reviewed, the Yard Machines isn’t as environment friendly as you’d like. To be specific, this gas snow blower isn’t CARB compliant. The other drawbacks to the gas snow blower, according to a few consumers, its spout gets clogged. Overall, the gas snow blower has received a rating of 4 stars out of 5 on Amazon with free shipping. If you’d like an environment friendly snow blower that can pack a punch, we suggest you check out the Snow Joe iON18SB Ion Cordless Single Stage Brushless Snow Blower. Having a patent-pending, rechargeable, 40-volt lithium-ion battery system, this electric snow blower is as environment friendly as the electric snow blower previously reviewed. But the former can cut a path 18 ins wide, and 8 ins deep, making it more powerful than the latter. To avoid causing any damage to your beloved yard, the aforementioned electric snow blower comes with a rubber scraper bar attached to its base. 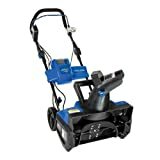 Apart from being better than the electric snow blower previously reviewed, the Snow Joe iON18SB Ion Cordless Single Stage Brushless Snow Blower is one of the best single-stage snow blowers commercially available right now. Single-stage snow blowers come with high-speed impellers that enable these tools to take in snow and then force it out of their chutes. Usually in the form of curved plastic paddles, the high-speed impellers make the snow blowers light and therefore easy to maneuver. The rest of the useful features of the electric snow blower are: LED headlight that enables you to clear away snow from your property in low light and even at night; chute that instantly rotates 180 degrees at a press of the switch; low vibration level; and no cord that can hassle you. Although the Snow Joe iON18SB Ion Cordless Single Stage Brushless Snow Blower appears to be an effective electric snow blower indeed, some consumers have complaints about it. They say this electric snow blower will need to be recharged several times in order to do heavy work, the chute might breakdown only after a brief period of use, and the electric snow blower itself is hard to maneuver along sidewalks. Nevertheless, the electric snow blower has received a rating of 4 and a half stars out of 5 on Amazon with free shipping. If you’d like a powerful snow blower that can do heavy-duty work, we suggest the Ariens 921030 Deluxe 28 254cc 28 in. Two-Stage Snow Thrower with Electric Start. Not only has this gas snow blower a 254 cc OHV engine; the machine is one of the best two-stage snow blowers currently available in the market. Unlike single-stage snow blowers, two-stage snow blowers in general come with a high-speed impeller and an auger feed, which work together to enable these machines to take in large amounts of snow. In fact, two-stage snow blowers are used to clear thoroughfares and airport runways. To make it better suited to heavy-duty work, the aforementioned gas snow blower comes with 13 in, deep-tread tires. Since the Ariens 921030 Deluxe is designed for home use, this gas snow blower comes with features that make maneuvering it easy. These features are ergonomic handles, easily accessible control panel and a remote controlled chute rotation to easily control discharge. The rest of the useful features of the gas snow blower are: quick, electric start-up at a press of a button; adjustable skid plate that allows you to raise or lower the height of the scraper bar and thereby enable you to clear away snow from dirt, concrete, and ice; discharge chute and deflector that you can remotely control; and integrated tool that enables you to easily clean these parts. Like the gas powered snow blower previously reviewed, the Ariens Deluxe is also not CARB complaint, which means it emits fumes that can be harmful to the environment. Despite this, majority of the consumers who own models of this gas snow blower are satisfied. Furthermore, the gas snow blower has received a rating of 4.1 stars out of 5 on Amazon with free shipping. 1. Choose the most suitable snow blower to your property. If the size of your property ranges from small to medium, a single-stage snow blower will be best for you. Unlike two-stage snow blowers, which are usually powerful, single-stage snow blowers in general can generate enough power for clearing away snow from small- to medium-sized properties. But if you own a large property, a two-stage snow blower will be best for you. 2. Know the features that you should be looking for in a snow blower. These features are an electric start-up and easy-turning features. Unlike a cord, which you may have to pull several times in order to fire up the snow blower, an electric start-up makes activation as easy as pressing a button. By easy-turning featureswe mean a snow blower’s features that make it easily maneuverable. No matter how state-of-the-art it might be, if your snow blower can’t easily turn, it makes clearing away snow from your property harder than it should be. Examples of easy-turning snow blower features are ‘triggers’, which are usually located on the handle bars, and an automatic differential. Having shared with you our knowledge of snow blowers, we hope to help you find the most suitable snow blower to you among the best snow blowers currently available in the market.